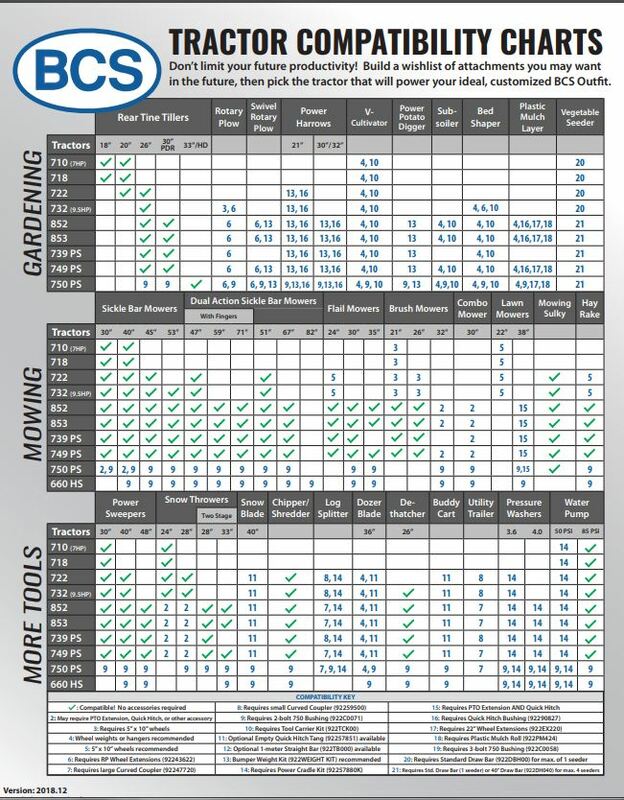 BCS now offers a 21″ and 32” Power Harrow for bed-style gardening operations. 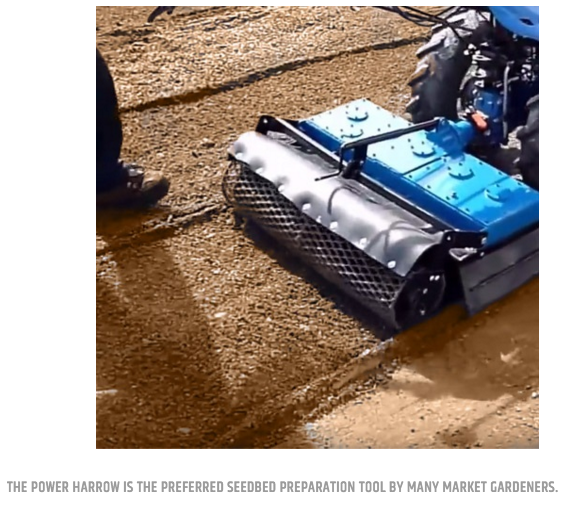 The Power Harrow, model name Clovis 32, is manufactured by Thivierge of Quebec and is the preferred seedbed preparation tool by many market gardeners. 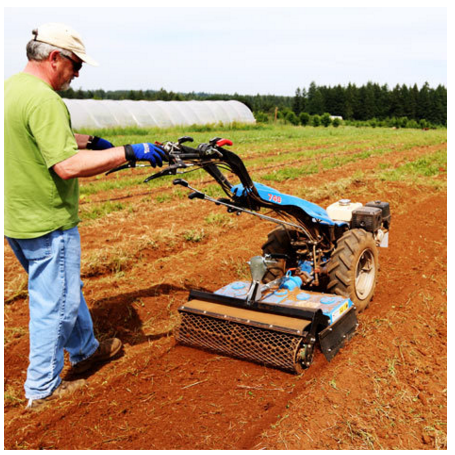 While the traditional BCS Rear-Tine Tiller mixes the soil with its vertically rotating tines, the Power Harrow’s knives turn horizontally, stirring the soil like an eggbeater. Lighter than competitive units, the Clovis 32 is easier to turn at the end of rows and its size is perfect for the 30”- wide growing beds that are popular among market gardeners. Its “throat”–the portion of the implement that extends from the tractor to the cover over the tines–is 2 3/4” shorter than competitive units, giving it a closer center of gravity to the tractor, thus more manageable to maneuver. The Clovis 32’s tine depth can be easily adjusted from 0 inches to 5 inches and also includes an integrated tang at the PTO connection point. The integrated tang has a wider bolt hole for the female tractor bushing, which provides a side-to-side “float” on uneven terrain. This integrated tang also means a Quick Hitch bushing is required to mount to all BCS tractor models. 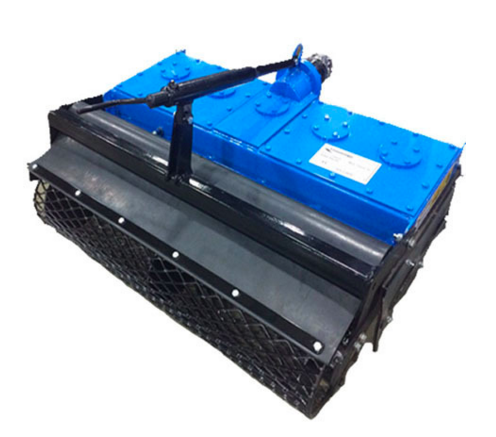 The gentle compaction of the mesh roller improves the performance of mechanical seeders. The roller also benefits the landscape industry by leveling uneven ground. Fits models 732 and up. We also recommend 12” wheels when coupled with models 749 and up. Required Accessory: Bumper Weight Kit for easier turning at the end of the row. Due to the Power Harrow’s integrated Tang, a Quick Hitch Bushing is required. Easily adjusts from 0 inches to 5 inches. 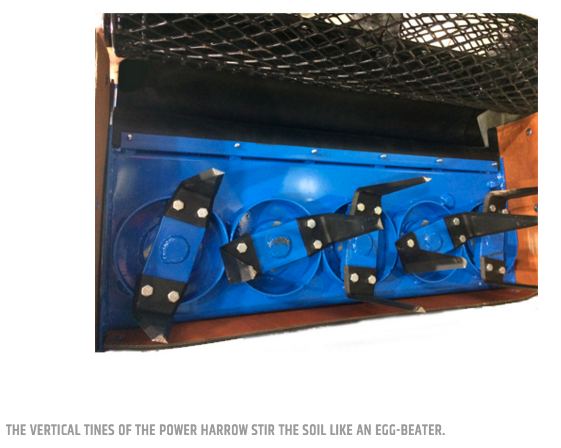 Stirs the soil, like an eggbeater, to preserve soil structure. Prevents weed seeds at deeper levels in the soil from being brought to the surface. Metal mesh roller provides precise depth setting and helps level ground. Perfect for popular 30”-wide growing beds.